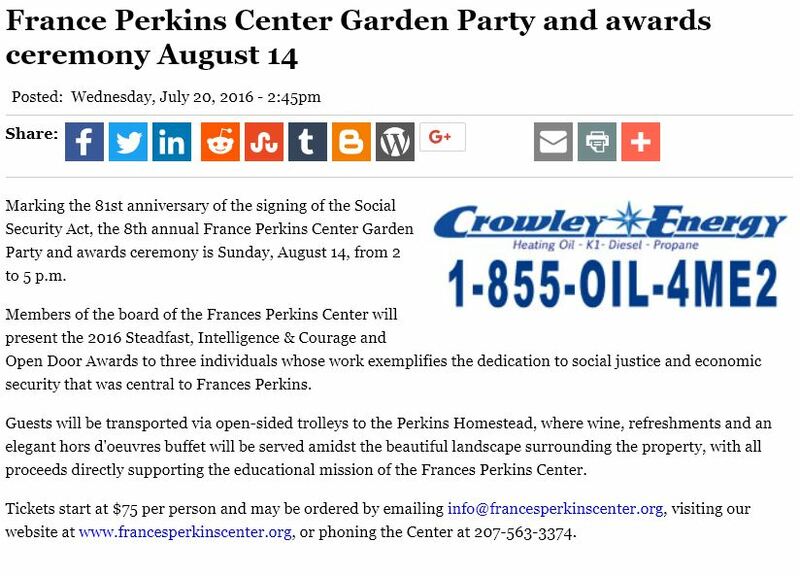 Marking the 81st anniversary of the signing of the Social Security Act, the 8th annual France Perkins Center Garden Party and awards ceremony is Sunday, August 14, from 2 to 5 p.m.
Members of the board of the Frances Perkins Center will present the 2016 Steadfast, Intelligence & Courage and Open Door Awards to three individuals whose work exemplifies the dedication to social justice and economic security that was central to Frances Perkins. Guests will be transported via open-sided trolleys to the Perkins Homestead, where wine, refreshments and an elegant hors d’oeuvres buffet will be served amidst the beautiful landscape surrounding the property, with all proceeds directly supporting the educational mission of the Frances Perkins Center. Tickets start at $75 per person and may be ordered by emailing info@francesperkinscenter.org, visiting our website at www.francesperkinscenter.org, or phoning the Center at 207-563-3374.